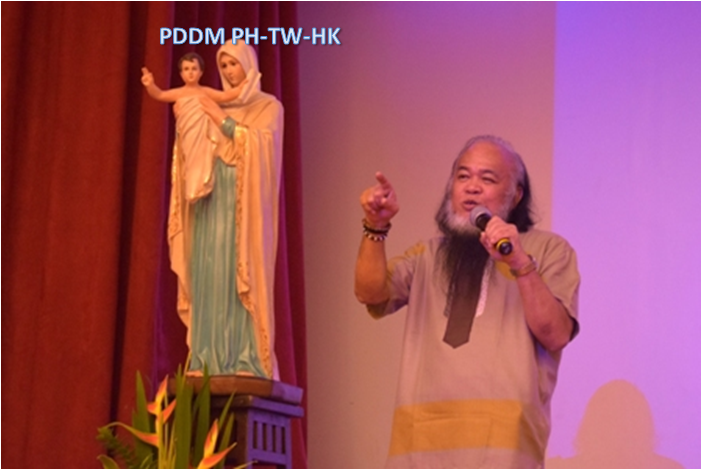 PDDM PH-TW-HK: As we close the year of the Clergy and Consecrated persons, the Philippine-Taiwan-Hongkong province took the initiative in celebrating a meaningful closing at Luzon area. On November 19, 2018 at 9 o’clock in the morning, the Province organized “A morning of gathering and reflection with Fr. Teresito “Chito” Soganub. Fr. Chito is a survivor of Marawi siege sometime in 2017. He was in captivity for 117 days and was able to escape. His testimony of faith and prophetic courage will serve as inspiration for all those who listened to his story especially for the clergy and consecrated persons. This gathering is open to all the clergy and consecrated persons; however, there were also lay people from some dioceses and organizations who attended. The Alberione Hall of the Society of St. Paul in Makati served as the venue of the occasion. Some members of the Pauline Family were also present. Fr. Chito shared his grace-filled life’s story with much enthusiasm and the hall was filled with silent reflection and holy laughter as well. The gathering culminated with the celebration of the Holy Eucharist which was presided by the Most Reverend Broderick Pabillo, Auxilliary Bishop of the Roman Catholic Archdiocese of Manila. After the Holy Eucharist, the assembly remained at the Alberione Hall for the sharing of meal. Sr. M. Anthony Basa expressed her heartfelt gratitude to all who came and responded to the invitation and also to the working committees headed by Sr. Nimfa Ebora, Provincial Councilor for Mission.